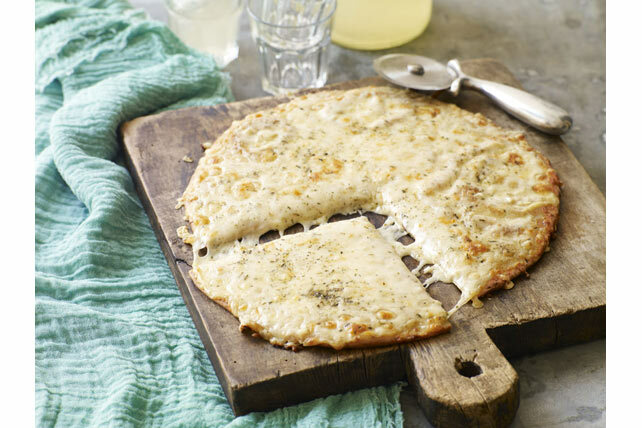 Skip the pepperoni and pizza sauce - this Cheesy Caesar Pizzeria Pizza uses Caesar dressing, garlic, a medley of shredded cheese and Italian seasoning for a fresh take on homemade pizza. Roll Perfect Parmesan Pizza Dough into 12-inch circle on lightly floured surface. Press onto bottom of 12-inch pizza pan sprayed with cooking spray, stretching dough as necessary to fit. Let stand 10 min. Mix dressing and garlic; spread onto dough. Top with remaining ingredients. Bake on bottom oven rack 17 to 18 min. or until crust is golden brown. Make every last bite delicious by spreading toppings right to the edge of the crust.